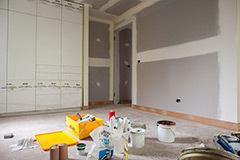 If you’re a home owner and looking to renovate your home for profit, you need to know which features are most important to home buyers. With more high density suburbs and parking becoming an issue, three out of five buyers considered garages to be the highest priority when searching for a home, according to realestate.com.au’s latest Consumer Intentions Study. More than half of the 2,343 people surveyed had somewhere to securely park their car as top of mind when searching for a new home. A further one in two respondents considered an ensuite bathroom or a built-in-wardrobe in the main bedroom to be a high priority during their property search. Interestingly, features popularised on home renovation shows such as The Block, like butler’s pantries and smart home technology, were not considered as important. Those who classified those features as a high priority were in the minority (8% and 11% respectively) of survey respondents. How easy is it to add these sought after home features if you don’t have them? Adam Hobill, building designer and founding director of Building Quote, shares his tips on adding high-demand property features when renovating for profit. These days, garages are a lot more than places to park a car. People use them to store bikes or camping equipment and set up home gyms. However, garages can be a dear item to build for what they are – quite a basic shell design. They can also take up quite a bit of space if land size is limited, typically around 40sqm. If renovators do decide to add car accommodation, they should avoid doing it on the cheap. “Prefabricated steel carport/garages can actually diminish the value of the house – you might actually be doing some real damage to the character and street appeal of the home,” Hobill says. Price range: With huge variations on the definition of a garage in terms of construction, Hobill is reluctant to give a price range. He says a carport can be anywhere from 30-50% cheaper than a garage. In the 1960s and 70s, the ensuite bathroom was first introduced into the home – typically a narrow room with a toilet, basin and tiny shower. Now the trend is to dedicate big spend and more space to the ensuite in the master bedroom. “I couldn’t think of the last time we designed a modern home that didn’t have some consideration to the ensuite bathroom,” Hobill says. Unfortunately, bathrooms are the most costly of the rooms per square metre to renovate. “You’ve got the full gamut of trades involved – waterproofing, joinery, tiling, plumbing, electrical, carpentry, painting, and more fixtures and fittings, taps, basins, joinery, towel rails, rope hooks, mirror cabinets, mirrors, tiling,” Hobill says. “And in any of those items range of costs from the low end to the high end is huge – so the key there is if you’re renovating for profit to do your research and shop around.” He says there are plenty of products in the affordable range that are tasteful and well-designed. However, you may need to spend more depending on the value of the property. Price range: $10,000 – $15,000 for a smaller space to $60,000 – $70,000 for something larger and more complicated. Price range: If you’re just adding a wardrobe to an existing room and not pushing out any more space, a reasonable BIW will start at $1,000. A more detailed, larger joinery wardrobe could be as much as $10,000. No longer the luxury item it once was, buyers will now expect some sort of cooling in a home. However, good insulation and air-conditioning should go hand in hand. Renovators should consider a solar passive response to cooling, including shading for the home, before purchasing an expensive cooling system. “As a designer I really advocate that new buildings should achieve better results if they are less reliant on artificial heating and cooling, but if you’re dealing with an older home you don’t always have that option,” he says. Price range: Single-room wall-mounted systems start at $1,000 – $1,500. A system for a whole house can range from $10,000 – $50,000.